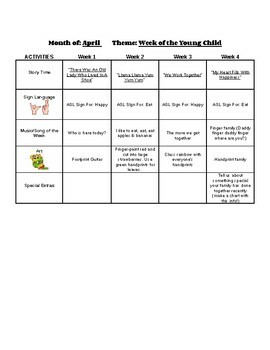 Monthly Lesson Plan Template for Infants - Includes A Free Lesson! This is a simple monthly lesson template, that is easily editable. It includes sections for music, books, arts/craft, Baby Sign/ American Sign Language, and special notes for each week. Included is an already completed lesson for the month of April that was made using developmentally appropriate practices, and the Revised Tennessee Early Learning Developmental Standards Birth–48 months.